Shop the latest men and women’s fashion. The youthful spirit of Giorgio Armani for a new generation – shop online for modern designer jackets, denim, tops, accessories, and more. Choose from dresses and jumpsuits, tops, tees, sweaters, jackets and outerwear, bottoms, pants, activewear, shoes, handbags, accessories, watches, sunglasses. Shop all the latest fashion trends. 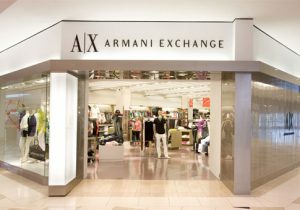 • Give the gift of style with the Armani Exchange gift card. • A|X Gift Cards are available for purchase in the amount of $25, 50, $75, $100 and $200 and may be used for purchases at participating A|X stores.